The week of Monday, January 23rd was 2017 National Drug Facts Week. The Pine Hill Police Department joined the national health observance for teens to help shatter myths about drugs. During the week’s activities Ptl. Marino, Ptl. Bruey, and SRO DiGiacomo spent time teaching L.E.A.D. Lessons at the John Glenn Elementary School, the Dr. Albert Bean Elementary School and the Pine Hill Middle School. 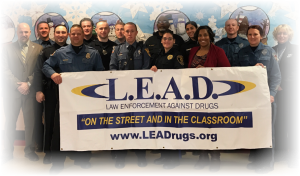 L.E.A.D (Law Enforcement Against Drugs) implements the program “To Good For Drugs” that helps our Officers proactively take a stand against drugs with students by supplying facts directly to students during each session. 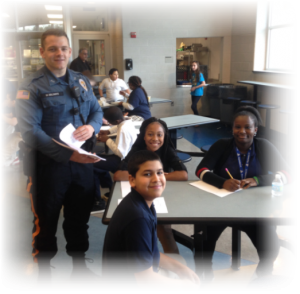 On Friday January 27, 2017 Officers from the Department met with the students of Pine Hill Middle School for an academic challenge during their lunch periods. Officers quizzed teams of students on their knowledge of certain types of drugs along with the effects they can have on the body. 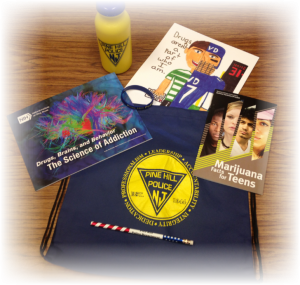 The participating students were rewarded with Pine Hill Police Department draw string bags filled with PHPD Gear and books (Supplied by the National Institute on Drug Abuse) covering the topics of Marijuana Facts and the Science of Addiction. On Tuesday, January 31st, 2017 Patrolman Martin Brennan graduated from the Law Enforcement Against Drugs (L.E.A.D) Training Course. Ptl. Brennan will join our LEAD Instructor Cadre; Sgt. Barrett, Ptl. Marino, SRO DiGiacomo, and Ptl. Bruey. LEAD Certification requires officers to attend a one week training course, prepare a full lesson plan each night and present it in front of their peers as if they were in a real classroom setting. The Pine Hill Police Department is committed to building trusting relationships with the children of our schools. The L.E.A.D program is a foundation for building these relationships. The program runs for approximately ten weeks with each lesson lasting for 40-45 minutes. During those ten weeks the Officers cover an array of topics including the dangers of drugs, goal setting, and making healthy choices or decisions that contribute to their overall well-being. Congratulations Patrolman Brennan and best of luck in your new role. Learn more about the National Drug Facts Week and a variety of drug facts to provide your teen or youth at https://teens.drugabuse.gov/national-drug-facts-week or by asking any of the Pine Hill Police Officers in our Community. To learn more about prevention and addictions please visit one of our partners, the Camden County Addictions Taskforce at http://addictions.camdencounty.com. As a community, we are constantly battling to prevent drug use and educate about addiction. Prevention starts with providing facts to our community’s youth of today and tomorrow. Please join us by providing facts to your teen or youth about drugs.